Spawned by the popularity of Bernt Spiegel's "The Upper Half of the Motorcycle" in its original German (now in its third edition and ninth printing), this English translation brings the book's provocative message to a wider audience. 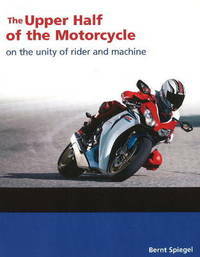 The author's metaphor considers the rider and the motorcycle as a single unit, the rider being the upper half. It draws on anthropology, psychology, biology, physics, and other disciplines to analyse the theory and function of the man-machine unit. Viewed through this multi-disciplinary prism, motorcycle riding is seen as a uniquely complex activity requiring insight and instincts as well as experience and training for the rider to operate the machine like an artificial limb -- as "part" of the rider himself. The ultimate goal for riders is the integration of the man-machine interface and development of their skills to the point of virtuosity. The book opens with a fascinating exploration of the development and workings of the human brain: how it was shaped by evolution, how many of our physical actions are controlled by "built-in" (subconscious) "programs", how we perceive our world (our "mesocosm"), how we use foresight, and how we learn and apply what we learn, particularly our remarkable adaptability. This second section describes the interaction between our built-in programs and our conscious actions and explores man's use of tools to extend his capabilities -- a motorcycle being one such tool. The third section discusses the "integration" of man and tool -- rider and motorcycle -- and the remarkable improvement in one's riding proficiency when rider and motorcycle begin to perform as an integrated unit rather than as a bundle of cargo on a means of conveyance. The fourth section suggests self-training techniques to achieve higher levels of performance, and the fifth section provides specific recommendations for practical training. In this book, motorcycling enthusiasts will discover new insights, unique perspectives, and invaluable advice that will challenge and improve their riding style, making it much more satisfying and enjoyable, and perhaps, with practice, even bringing it "to the point of virtuosity". A behavioural psychologist, design consultant, university professor and founder of the Spiegel Institut in Stuttgart, Bernt Spiegel has spent over 50 years working on man-machine interface issues. This book reflects his unique views of the physical and psychological relationship riders have with motorcycles and the concept of motorcycles coming to function as an "artificial limb" for master riders.